So it was the dragon egg that helped Ursula and Cruella stay young? Great! Good thing we got a half-hearted explanation. It was Dragon Placenta, it does wonders for the skin! Mostly I really enjoyed this episode. Cruella’s backstory was great twisted play on both the trapped princess in her tower type story and 101 Dalmatians. It’s also nice to see a character that doesn’t have any shades of grey, she just psychotic and much crazier than she Disney counterpart. Also love that she hair is the result of the ink. But something is nagging me, how did she get to the Enchanted Forest? Remember when Realm hopping was hard? I guess another slight nitpick I have is that Cruella’s story realm, as they are called, is the 20’s but 101 Dalmatians is set in the 60’s. That means 101 Dalmatians in the context of the show is set in the 20’s because time doesn’t move. Or is the show implying Cruella was was in her like in her 50s or 60s during the events of 101 Dalmatians, assuming she was 18 in 1920 making her born in 1902 but it’s very clearly said in 101 Dalmatians that Cruella was Anita’s school friend making them roughly the same age. Easier to assume 101 Dalmatians was just set in 20’s than to do mental hoops. One other question does Cruella’s story realm have other stories set in the 20’s? Like The Great Gatsby? I mean Isaac was reading that book in this episode so one can assume that that story is in the realm. 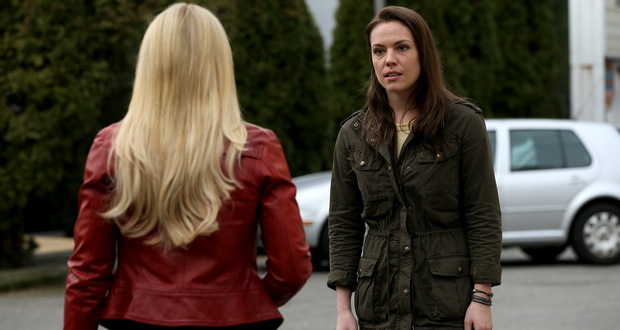 In Storybrooke, Emma is still whining about her parents lying to her. Basically, Emma holds them to a higher standard, so them lying to her is a super big deal to her. Whereas former villains, like Regina and Hook, Emma okay with because they were honest. So having remorse over something that Snow and David did with wrapped good intentions and knowing what they did was wrong is less redeemable than two people who did bad things for the hell of it and out of revengence. Emma needs to grow up she met her parents at the age of 28 and kept them at arm’s length for a awhile, not sure how time passes in Storybrooke. Anyway Emma’s constant complaining about her parents is not a good character arc. 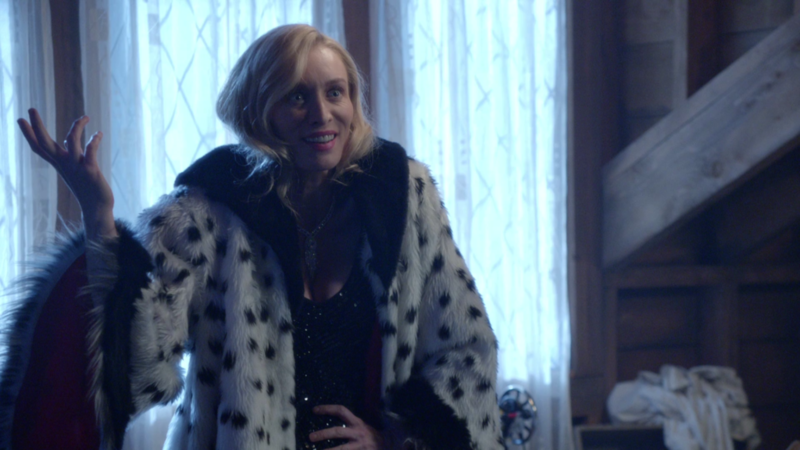 Speaking of Emma, she kills Cruella setting her on the path of darkness like Rumple wants. Though she was acting in defense of her child, so it’s leap to think that this puts her on a “dark” path. But speaking of the Dark one, Rumple’s motivations for all the fate rewriting is that because of all his dark deeds his heart will be incapable of love. So his “evil” motivation does come from a place of love which is typical of his character but it seems a little too late for him to get back to being interesting. All Rumple had to do was nothing back when he saw the sorcerer’s hat but he couldn’t resist power so he not sympathetic because it was the second time his chose power over his family so now that his heart is becoming devoid of love isn’t enough. I did like this episode, especially the past potion with Cruella. I do wonder how long she will stay dead? Though Graham and Neal of still dead. So Emma is Anakin Skywalker and Rumple is the Emperor, he trying to get her to the dark side but gasp girl-pal Regina is a more successful Obi-Won. I do like Gal-pal Regina on their magical road time to save Robin and find Lily. They do find Lily in Lowell Massachusetts. And hey, the show got the distance between Lowell and Boston right. So as you MIGHT have figured this episode is about Lily, Maleficent’s daughter and it’s a mixed bag. Emma is still whiney about her parents till she runs into Lily, who knowing everything about the Enchanted Forest people, wants revenge on the Charmings. Emma is about to kill Lily but Gal-pal Regina talks her out of it and Lily joins the road trip to NYC to save Robin. The past section is about young Emma and Lily. Lily gets into trouble and gets Emma kicked out or new foster family’s house. After Emma pushes Lily away again, even though fate wants them to be together, the apprentice tells Lily everything. I have a minor major issue with is plot development. The apprentice could have sent her to Storybrooke and given her the entry scroll like Ingrid but instead he tells her the story and leaves her to fend for herself. I did like the yoda line but I like Star Wars. It was mixed episode but the shock at the end was interesting, Zelena is pregnant. I do wonder how long Zelena could kept the Marian glamour going since the child would presumably looked nothing like Marian. She could be lying as Zelena does because she is a liar.